Listen to "The Complete George Smiley Radio Dramas: BBC Radio 4 full-cast dramatization" on your iOS and Android device. 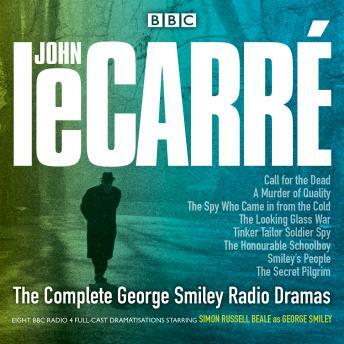 The complete collection of acclaimed BBC Radio dramas based on John le Carre's bestselling novels, starring Simon Russell Beale as George Smiley. With a star cast including Kenneth Cranham, Eleanor Bron, Brian Cox, Ian MacDiarmid, Anna Chancellor, Hugh Bonneville and Lindsay Duncan, these enthralling dramatisations perfectly capture the atmosphere of le Carre's taut, thrilling spy novels. The Secret Pilgrim sees Smiley invited to dine with the eager new recruits at the Circus. He offers them his thoughts on espionage and, in doing so, prompts a former colleague to re-examine his own eventful secret life. 'A radio triumph...Simon Russell Beale's pitch-perfect master spy' - 'Financial Times'.